That’s what this segment is all about. Today, a look at what I didn’t expect in Abu Dhabi. 1. It’s NOT a “dry heat” — Whoever said the desert is dry and therefore doesn’t feel as hot is full of crap. Loads and loads of crap. The UAE is hot AND humid thanks to that little thing called the Arabian (Persian) Gulf. Read: terrible, horrible hair days. If it wouldn’t have been viewed as offensive, I might have actually considered wearing a hijab just to cover the frizz. If you have curly/wavy/frizzy/anything-but-stick-straight hair I recommend bringing lots of hair products to avoid an out of control situation. Oh, and simply breathing in 115 degree weather with 70% humidity and “blowing dust and sand?” It’s super easy. Trust me. Yes, of course I’m lying. 2. Emiratis are not prevalent — I came here expecting to meet a ton of Emiratis who would be able to share stories about their culture and what it’s like growing up in the UAE. I was shocked to discover nearly every person I interacted with each day was instead considered “South Asian.” A whopping 50% of the inhabitants fit into that category, which predominantly includes people from India, Pakistan, Bangladesh and Nepal. There are also a lot of Filipino and Malaysian residents. A measly 19% are Emirati, and that’s a number the most recent census count considers “on the high end.” Although the country’s population is increasing by leaps and bounds (14% from 2005-2010), that’s largely due to immigration and not because the Emiratis have been exponentially prolific. 3. Good luck finding “Emirati” food — I searched high and low for native cuisine, because trying local dishes is one of my favorite reasons for traveling. Again and again, I found a whole lot of Lebanese (YUM) but nothing really called “Emirati.” I asked someone who lived in the UAE for many years and he said there really is not a local cuisine because the native people were nomads for so long and ate whatever they could find in the desert. He said that largely consisted of a lot of rice and grilled chicken, fish and seafood. I certainly did eat a lot of rice and grilled/skewered meats and veggies… but they were labeled Lebanese, Egyptian and Turkish. Look, I don’t care what we call it, everything I ate was delectable. Also delish is the top-notch Indian cuisine, which is pretty much everywhere due to people of that culture being in the majority (see point #2). 4. 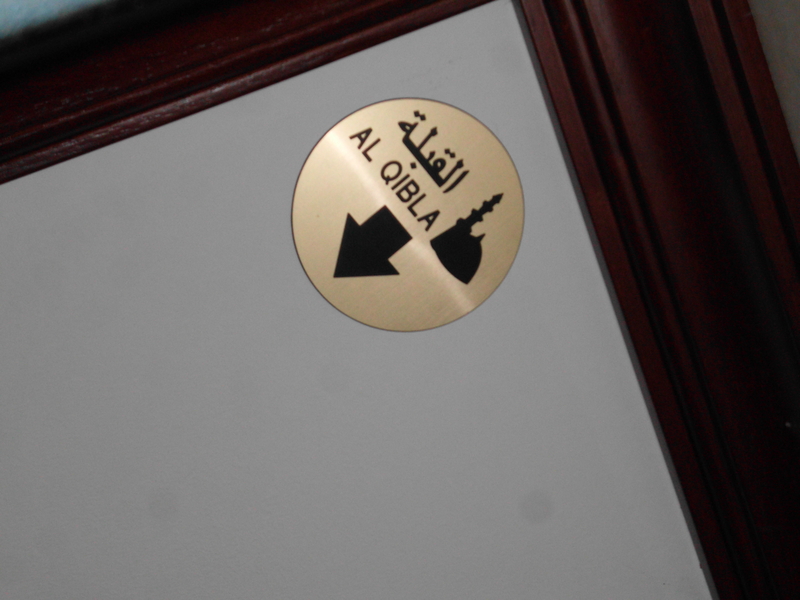 Qibla markers in hotel rooms — I stayed in a few different hotels in the UAE and suddenly noticed something shiny on the corner of the ceiling. Upon further investigation, I saw a little arrow on the ceiling plate, with the word “Qibla.” Qibla is the direction Muslims face when praying, usually five times per day. It was cool to see the helpful markers taking the guesswork out of the practice. 5. Call to prayer — Although I knew Muslims pray five times per day, I didn’t realize that Muslim countries have an audible call to prayer. The first time I heard it, I didn’t know what was happening and grew nervous. It first reminded me of an evacuation warning, but eventually I came to enjoy the calls… except when they happened at 3:00 a.m. (the timing changes throughout the year and the scheduled prayer times shift by a couple minutes every few days). For anyone unfamiliar with how the call to prayer works, here’s an explanation. A muezzin is chosen to recite the call to prayer and his voice is projected from loudspeakers on the minarets of a mosque. The call can be heard for surprisingly long distances. It was amazing to be in areas close to several mosques to hear all the calls to prayer occurring simultaneously. After I grew used to the sound, I actually found it calming for the most part and enjoyed being outdoors to hear it. It was interesting to hear the different styles at different mosques. On a superficial level, it made me appreciate the muezzins who had particularly lovely voices. Below is a video of part of an afternoon call to prayer in Abu Dhabi (the call typically lasts for several minutes). 7. Bars=smokescreen — As cosmopolitan as the UAE’s cities seem to be, they’re rather behind when it comes to smoking in bars. At least by U.S. standards. Not only can people smoke in bars, but smoking still seems to be a way of life for many people, making bars THICK with smoke. It brought back terrible memories of my early bar-going days. Way back then, it didn’t matter how tired you were or if it was 4:00 a.m., you just had to shower to remove the smoke film before going to bed. That’s how it felt in Abu Dhabi… although maybe even worse because a lot of the men were smoking strong cigars instead of cigarettes. 8. It’s incredibly clean — I arrived expecting dust and sand to cover everything and for the streets to be littered with debris, like I sometimes encounter in Caribbean nations. But in Abu Dhabi, I found almost no litter, no overflowing trash bins, no vermin. Additionally, having been to a lot of cities where people smelled less than appealing, I figured Abu Dhabi’s insane heat would lead to horrible body odor. It’s evident every once in a while but I truly couldn’t believe how well groomed and fresh smelling the residents are. Particularly the Emiratis, who appear to have a penchant for wonderful cologne. I found myself self-conscious about dripping enough sweat to fill a water bottle and I had the urge to shower approximately 15 times per day. I later found out that practicing proper hygiene is part of Adab, or Islamic etiquette. The cleanliness of both the city and the people won me over. 9. No animals? — Perhaps I shouldn’t have been surprised at the lack of animals other than humans, but I was. I’m sure the heat renders the area uninhabitable for many living things, but I expected at least to see a lizard. Nope. All I could spot were a few small birds along the water and a handful of feral cats (ew). 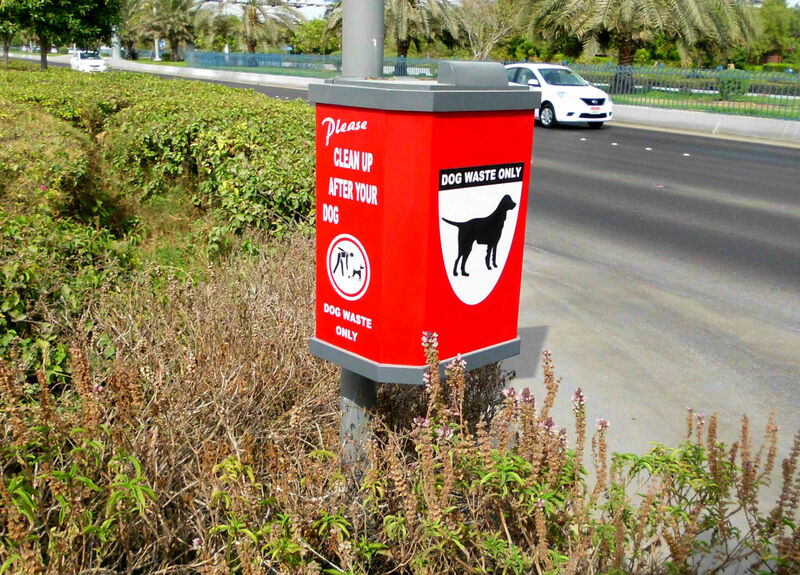 Although I saw a dog waste receptacle, I didn’t see a single dog in nearly a month of staying in Abu Dhabi. The doggie waste receptacle struck me as comical considering I couldn’t find a single pup. Who knows, maybe more animals exist and become more visible in the winter months when it’s cooler. Obviously, everyone’s experience is different and these are just some things that struck me, personally. Let me know in the comments section if you were surprised by anything while visiting Abu Dhabi (or other parts of the UAE). I agree. It’s amazing how much other cultures know about us, but how Americans are so uninformed about others. One of my favorite parts of traveling is learning all these things that make countries, people and cultures unique.